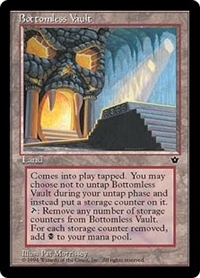 T, Remove any number of storage counters from Bottomless Vault: Add B for each storage counter removed this way. 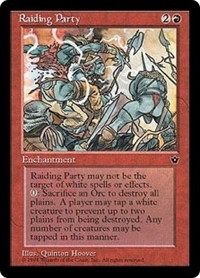 1W: Prevent the next 1 damage that would be dealt to any target this turn. 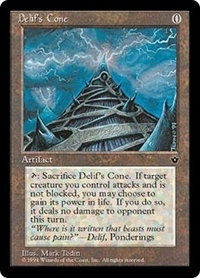 T, Sacrifice Delif's Cone: This turn, when target creature you control attacks and isn't blocked, you may gain life equal to its power. 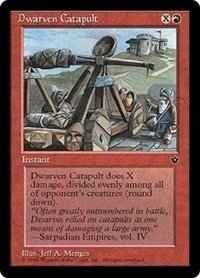 If you do, it assigns no combat damage this turn. 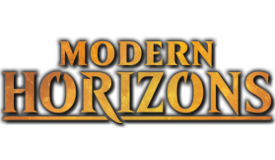 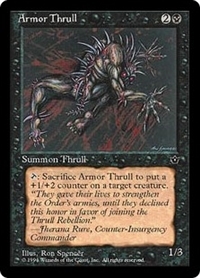 • Destroy target creature with power 2 or less. 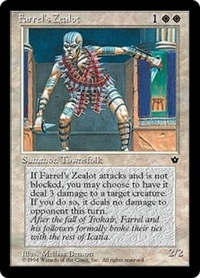 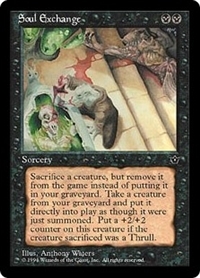 • Look at the top three cards of target player's library, then put one back and the rest into that player's graveyard. 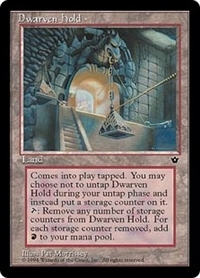 T, Remove any number of storage counters from Dwarven Hold: Add R for each storage counter removed this way. 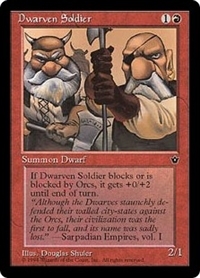 1R: Target Dwarf creature gets +1/+0 until end of turn. 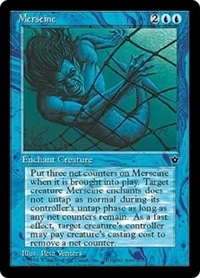 1G: Target blocking creature gets +0/+1 until end of turn. 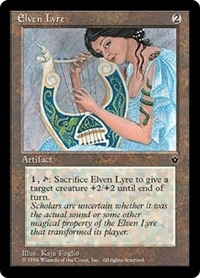 1, T, Sacrifice Elven Lyre: Target creature gets +2/+2 until end of turn. 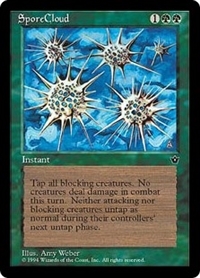 1G, T: Target creature doesn't untap during its controller's next untap step. 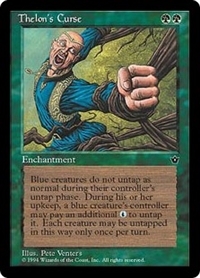 G, T: Untap target attacking creature you control. 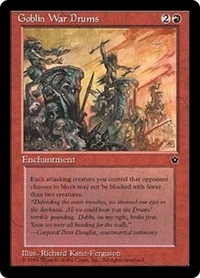 Prevent all combat damage that would be dealt to and dealt by it this turn. 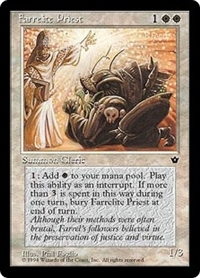 1: Add W. If this ability has been activated four or more times this turn, sacrifice Farrelite Priest at the beginning of the next end step. 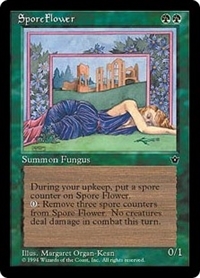 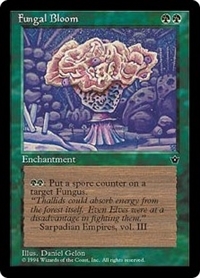 GG: Put a spore counter on target Fungus. 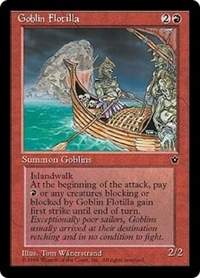 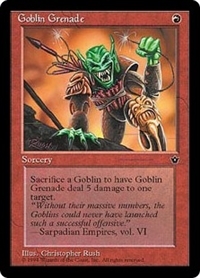 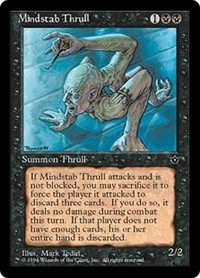 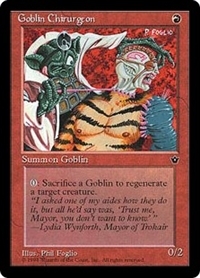 At the beginning of each combat, unless you pay R, whenever Goblin Flotilla blocks or becomes blocked by a creature this combat, that creature gains first strike until end of turn. 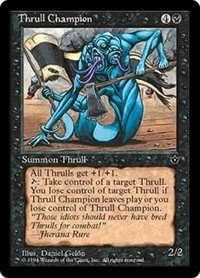 R: Target creature you control with toughness 2 or less gains flying until end of turn. 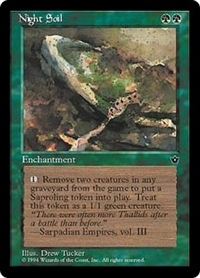 Flip a coin at the beginning of the next end step. 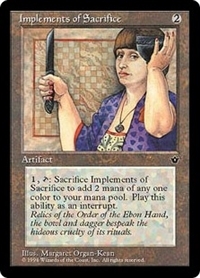 If you lose the flip, sacrifice that creature. 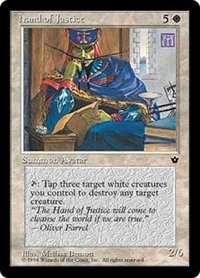 T, Tap three untapped white creatures you control: Destroy target creature. 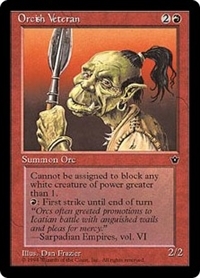 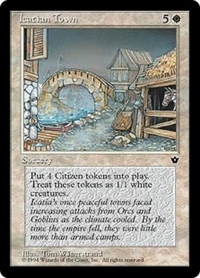 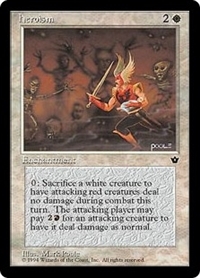 Sacrifice a white creature: For each attacking red creature, prevent all combat damage that would be dealt by that creature this turn unless its controller pays 2R. 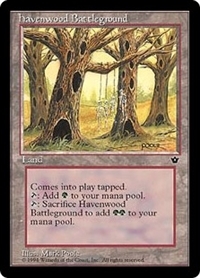 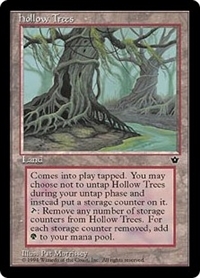 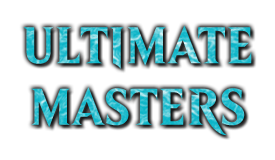 Until end of turn, whenever a player taps an Island for mana, that player adds an additional U.
T, Remove any number of storage counters from Hollow Trees: Add G for each storage counter removed this way. 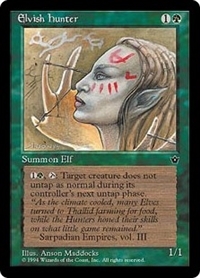 U: Tap target green creature. 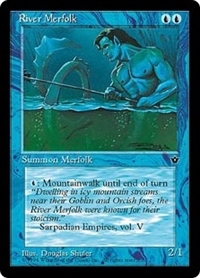 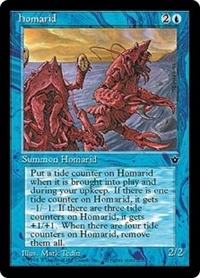 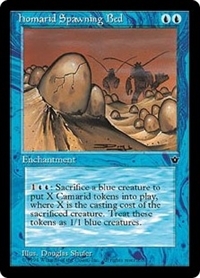 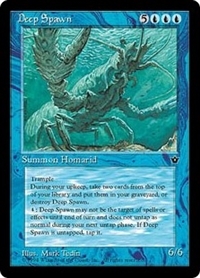 1UU, Sacrifice a blue creature: Create X 1/1 blue Camarid creature tokens, where X is the sacrificed creature's converted mana cost. 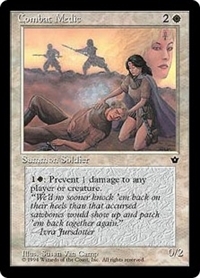 1W: Target Soldier creature gets +1/+0 until end of turn. 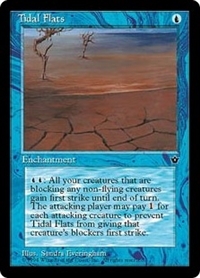 1, T: Target creature gains first strike until end of turn. 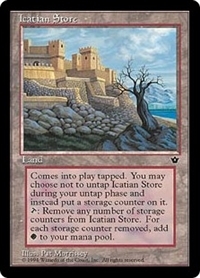 T, Remove any number of storage counters from Icatian Store: Add W for each storage counter removed this way. 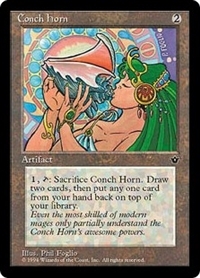 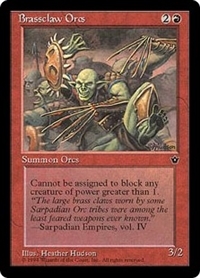 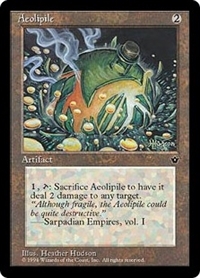 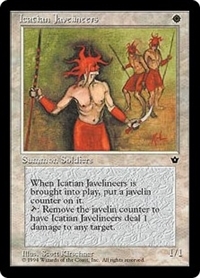 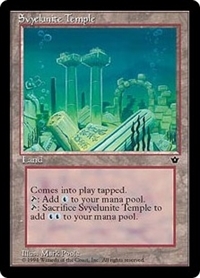 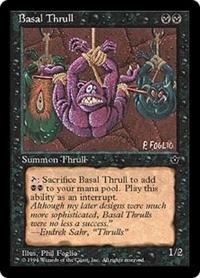 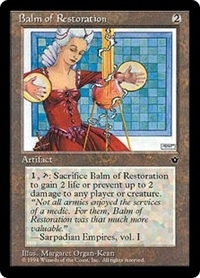 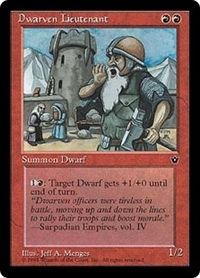 1, T, Sacrifice Implements of Sacrifice: Add two mana of any one color. 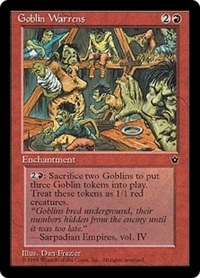 1: Add B. 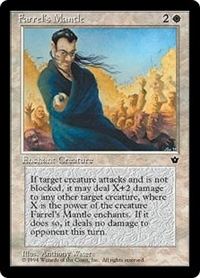 If this ability has been activated four or more times this turn, sacrifice Initiates of the Ebon Hand at the beginning of the next end step. 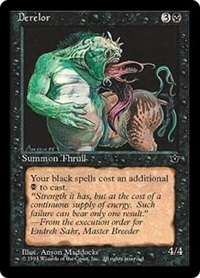 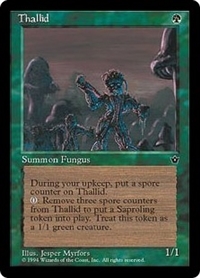 1, Exile two creature cards from a single graveyard: Create a 1/1 green Saproling creature token. 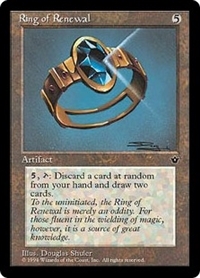 1: Flip a coin. 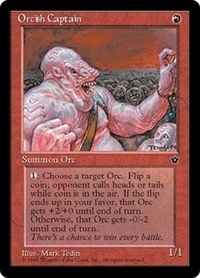 If you win the flip, target Orc creature gets +2/+0 until end of turn. 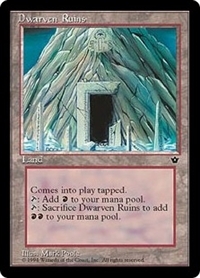 If you lose the flip, it gets -0/-2 until end of turn. 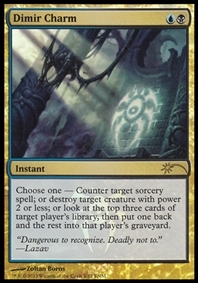 T: Look at the top three cards of target player's library. 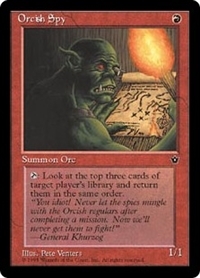 R: Orcish Veteran gains first strike until end of turn. 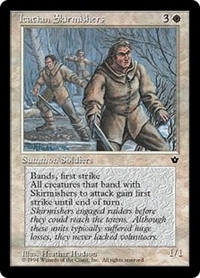 W: Order of Leitbur gains first strike until end of turn. 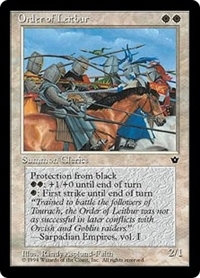 WW: Order of Leitbur gets +1/+0 until end of turn. 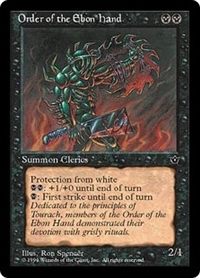 B: Order of the Ebon Hand gains first strike until end of turn. 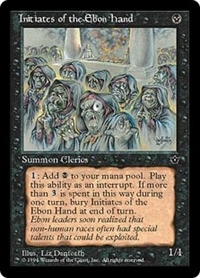 BB: Order of the Ebon Hand gets +1/+0 until end of turn. 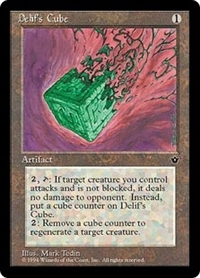 T: Add one mana of any color. 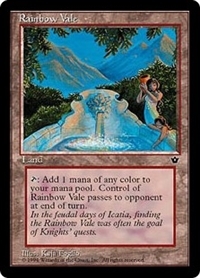 An opponent gains control of Rainbow Vale at the beginning of the next end step. 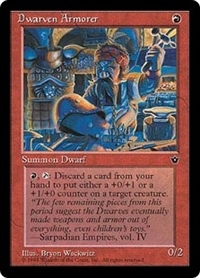 5, T: Discard a card at random, then draw two cards. 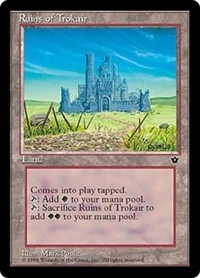 T, Sacrifice Ruins of Trokair: Add WW. 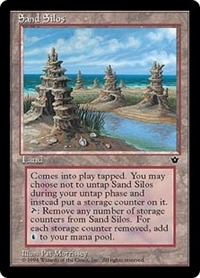 T, Remove any number of storage counters from Sand Silos: Add U for each storage counter removed this way. 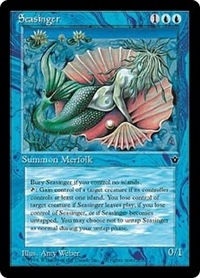 T: Gain control of target creature whose controller controls an Island for as long as you control Seasinger and Seasinger remains tapped. 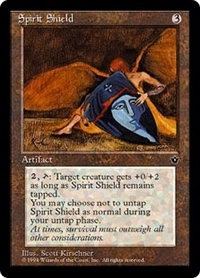 2, T: Target creature gets +0/+2 for as long as Spirit Shield remains tapped. 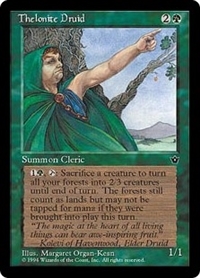 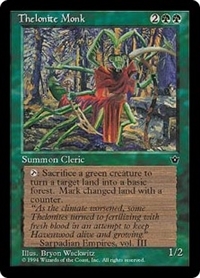 1G, T, Sacrifice a creature: Forests you control become 2/3 creatures until end of turn. 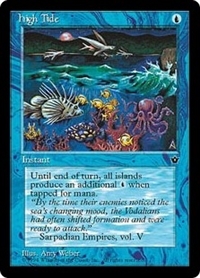 They're still lands. 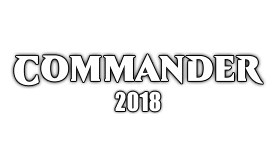 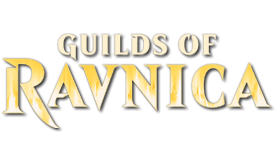 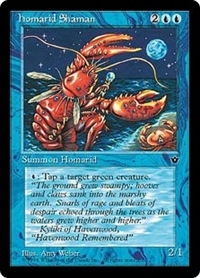 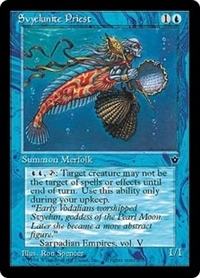 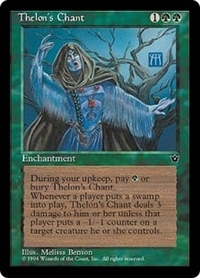 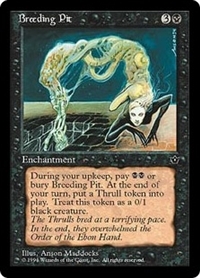 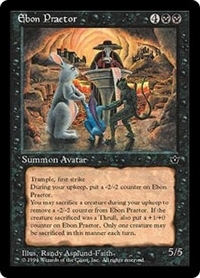 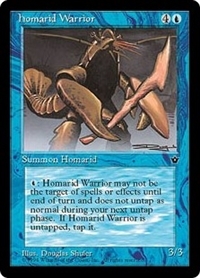 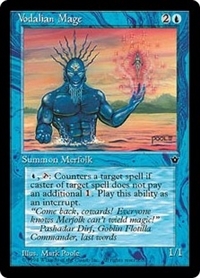 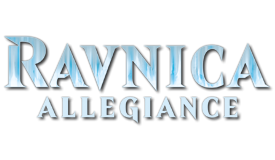 At the beginning of your upkeep, sacrifice Thelon's Chant unless you pay G.
At the beginning of each player's upkeep, that player may choose any number of tapped blue creatures they control and pay U for each creature chosen this way. 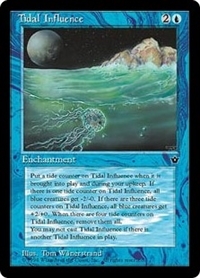 If the player does, untap those creatures. 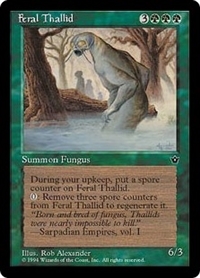 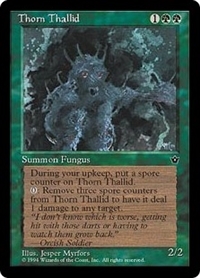 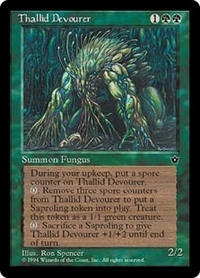 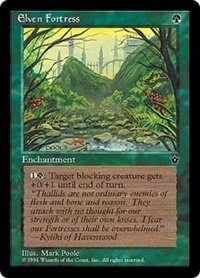 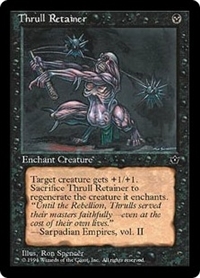 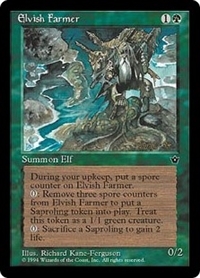 Remove three spore counters from Thorn Thallid: Thorn Thallid deals 1 damage to any target. 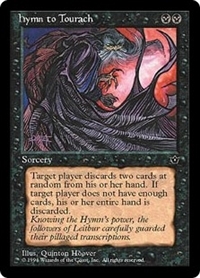 1B: Counter target black spell unless that spell's controller pays B or 3. 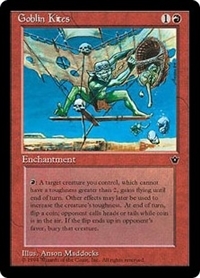 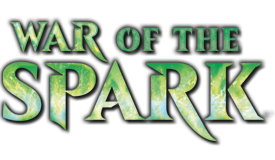 UU: For each attacking creature without flying, its controller may pay 1. 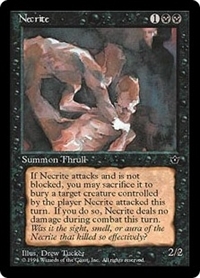 If that player doesn't, creatures you control blocking that creature gain first strike until end of turn. 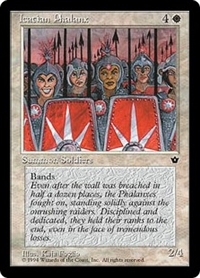 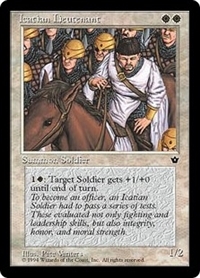 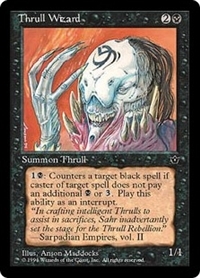 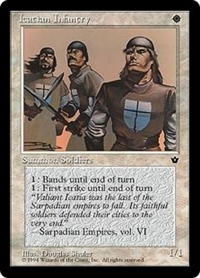 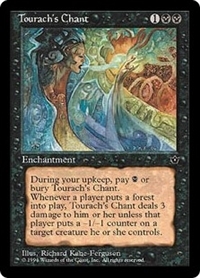 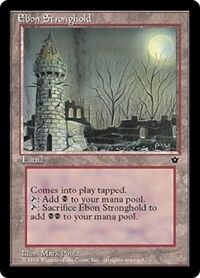 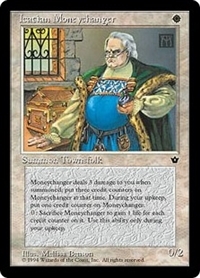 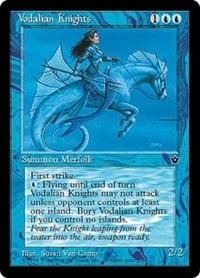 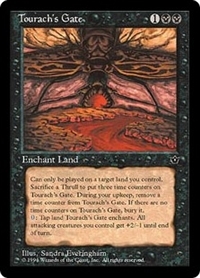 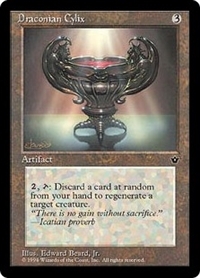 At the beginning of your upkeep, sacrifice Tourach's Chant unless you pay B.
U: Vodalian Knights gains flying until end of turn. 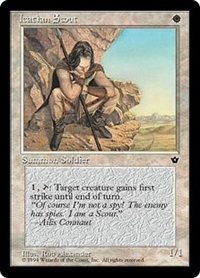 U, T: Counter target spell unless its controller pays 1.